One thing most of you don’t know about me (until now) is that I love to read cookbooks. From cover to cover, like a novel. 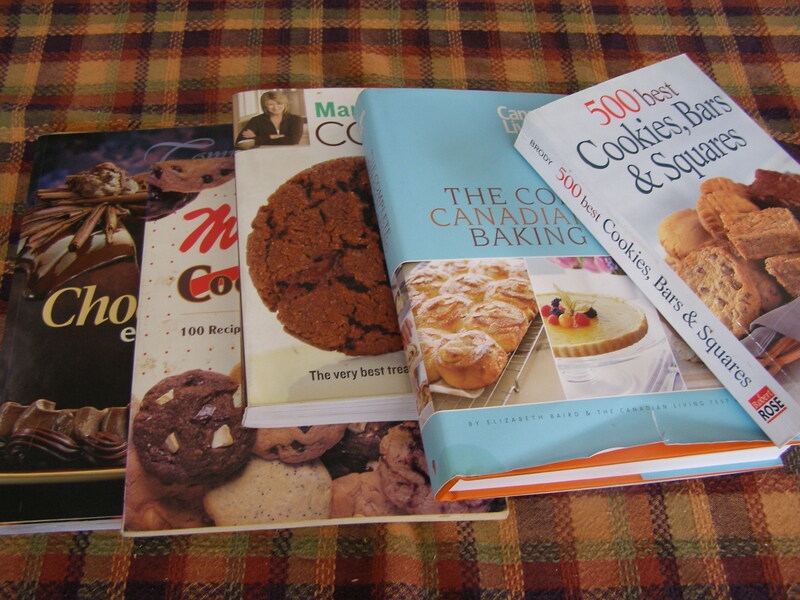 I am much better now, but I used to ask for cookbooks almost as much as other kinds of books. They are just so pretty and delicious and hard to resist. So, when I saw Salad Love, I couldn’t resist. I have a lot of cookbooks, but not one that is solely about salads. 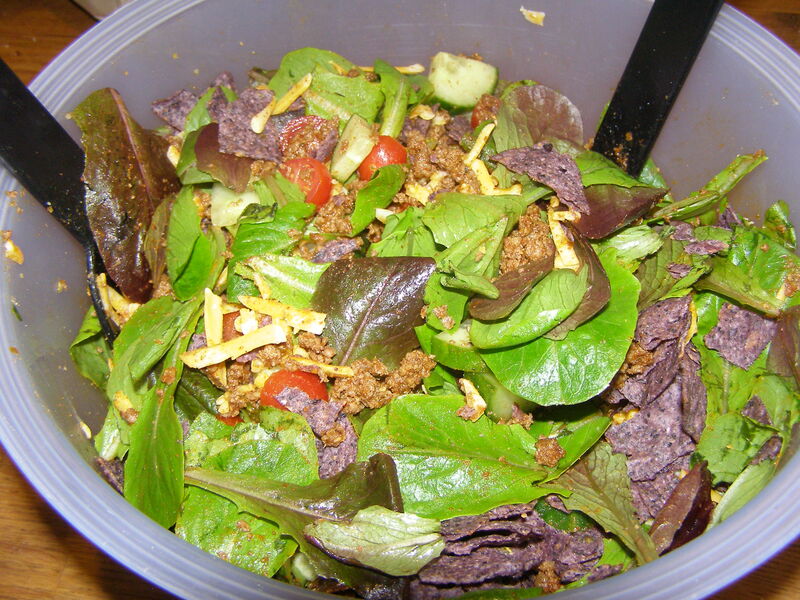 And, if you are anything like me, you have good intentions about making salad more often, but then end up not doing it. Especially in the winter, it is hard to come up with something new and interesting, using seasonal and local ingredients. Salad Love is full of pictures of colourful salads. And, they are categorized according to season. Sometimes in Canada and other cold countries, it’s hard to eat entirely by season if you want to eat any kind of fresh fruit or vegetable ever in the winter. But, this book gives ideas on how to make a salad using colder weather ingredients such as beans and lentils, rice, barley, couscous, cabbage, kale, and grated root vegetables. The best thing about Salad Love, is that it inspires me to want to eat salad. When I look through it, my mouth starts to water and I want to rush to the store to get some fresh vegies and feta cheese (mmm… greek salad). What a refreshing change from looking through my usual books filled with cookie and cake recipes, and getting out the butter and sugar to start baking. Although, I have to admit that this will never stop happening. Still, it’s good to have a salad first. 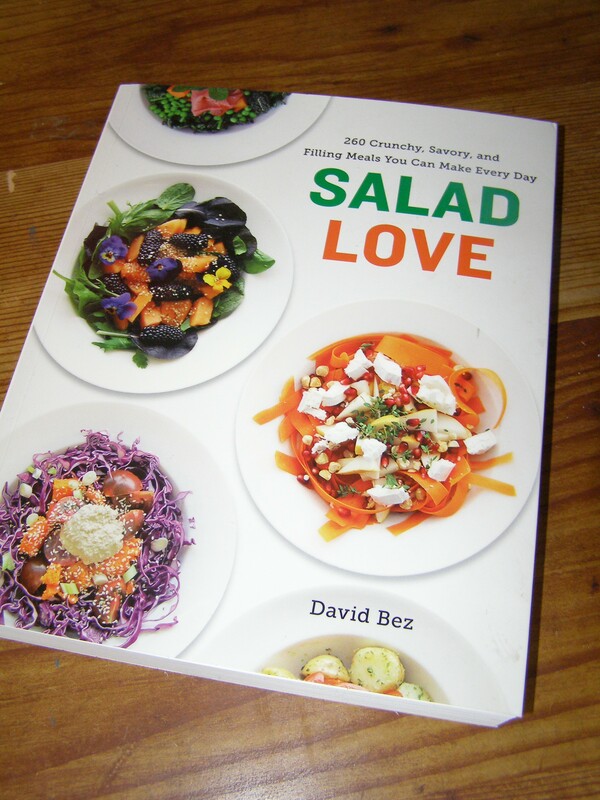 David Bez’s book is a result of his popular blog Salad Pride, which he created after his co-workers expressed interest in the different lunches he prepared for himself each day. Do you like to read cookbooks cover to cover? Do you have too many cookbooks, but find it hard to give any away, just in case you might suddenly need one of the recipes within (even though most of your recipe browsing is now done online)? Do you have a favourite salad recipe? A favourite cookbook? One way we ate healthier (for awhile) was to sign up with a farm that delivered fresh produce to a drop-off point every other week. But I have to admit, we got sick of eating the same vegetables for months on end, because in any climate, the same things are in season for a long time. Here in Austin, it delivered all year around, but farther north, my brother’s delivers until the fall, when they get a huge heap of root vegetables and then they’re done for six months. I don’t know if they have something like that in Canada or not. Here, it’s called community-supported agriculture. There’s a web site named Local Harvest where you can see if there is anything available in your area. Good luck with the salads! Although I’m not a salad fan, they’re much more fun to eat when they have interesting things in them. We do have that here, as well, but it’s not year-round. We tried it for a while, but, like you, got tired of receiving certain vegies (the ones that grow and grow but no one wants), so we prefer to go to the Farmer’s Market every weekend and pick out the stuff we want. Our Farmer’s Market has been open right up until Christmas the last couple of years, then opens up again in April, so there is not too much of a gap. That’s a good thing to do, too! Supports the local farmers. I need to get back into doing that, although you still see the same veggies for ages on end. I have several confessions with this post. 2. I have never been able to follow a recipe, I have to just throw things in as per my feelings about the food in my fridge that day. Make the salad dressing from the juice of the 1/2 grapefruit, avocado oil, and fancy mustard shaken together. I have read some of Nigel Slater’s cookbooks cover to cover as they’re very readable. (They’re also full of interesting recipes that aren’t too difficult for the average home cook to pull off!) 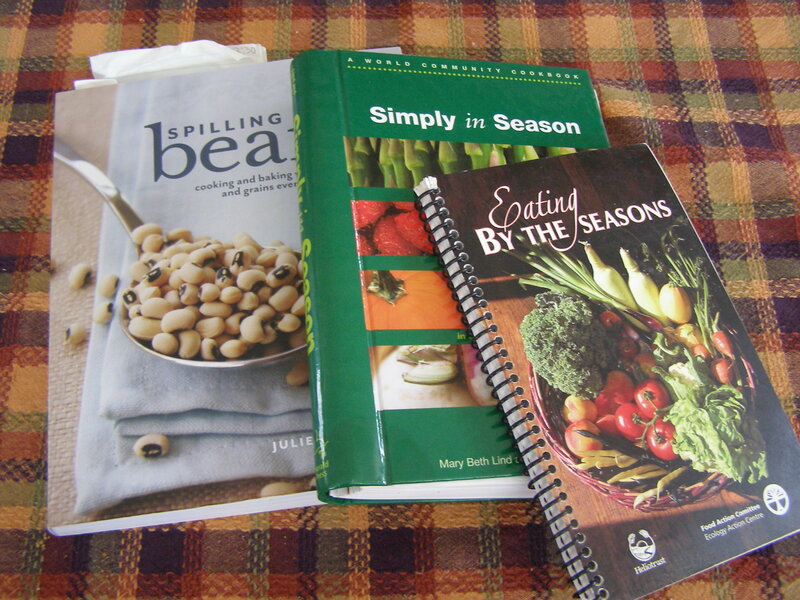 I love his Kitchen Diaries books as they focus on eating with the seasons. David Bez’s Salad Love sounds like a good find for you. I have never read one of Slater’s cookbooks – thanks for the recommendation! I love going to flea markets and library book sales to look for old cookbooks. Kid #2 and I like to sit together and go through them cover to cover. I like Saveur cookbooks because they are just so pretty, but my favorite would be Jaques Pepin’s Fastfood My Way (good food truly fast to cook) and Mark Bittman’s How to Cook Everything (because you can truly find a recipe for everything). I am happy to see I am not alone in my love of cookbooks. No, I haven’t read the CanLit Foodbook – gone to look it up right now! My wife loves cookbooks though now she gets most of her recipes from the net. Based on your review I will get here this one. Thanks Naomi, I can alway count on reading about interesting books on your blog.